Q: Why we doin’ this again? OK. Well. OK. Let’s do it this way. Take chickens for example. Most of the chickens of the world have been mutilated (beaks trimmed) and mistreated. 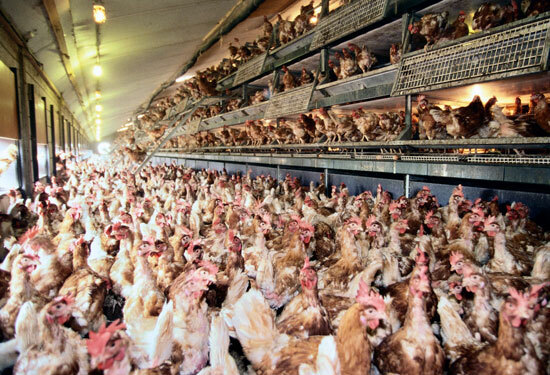 They are crammed into cages or, if cage-free, crammed into houses. They don’t see the sun. They can’t run, hide or scratch for worms. They are not utilized…their design is not appreciated. They are simply fed and mined for 18 months. Mined for eggs. They are given just the right amount of feed to maintain high production, not high quality. Often this is an all-natural, vegetarian diet. What is natural about feeding a vegetarian diet to an omnivore? I don’t think any of that is right. Any of it. Birds are a tremendous blessing to our farm. They eat bugs and worms and larvae, they put down manure, they spread cow patties to help limit repugnancy zones (livestock don’t want to graze up against their own poop…imagine that. The chickens spread a cow patty out so it decomposes more quickly (think surface to volume ratio)). We work hard to keep them on pasture when it is appropriate, to keep them near to and behind the cattle, to keep them safe from predators, to meet their varied dietary needs and honor their design. Boy golly, let them see the sun! But you know what? That’s expensive. If I built a confinement facility and crammed birds in by the thousands I would have to amortize the facility over time but chores would be easy. 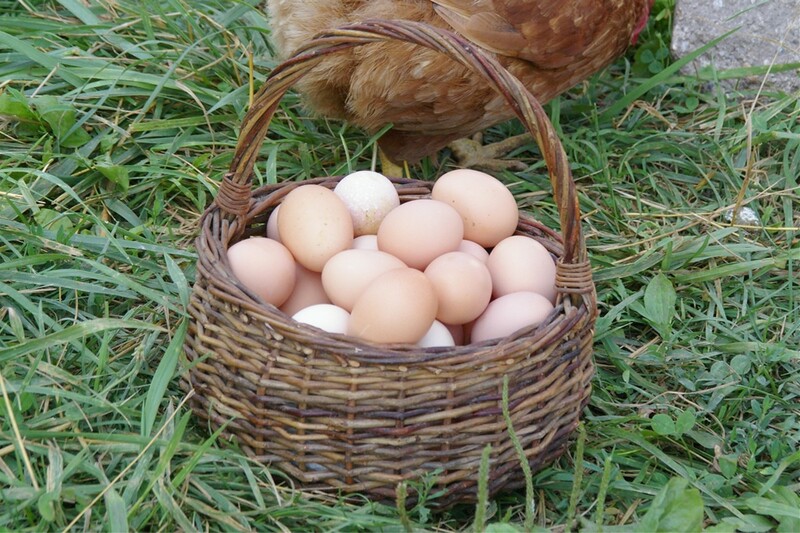 I wouldn’t have to walk sometimes miles each day to give my birds food and water and to collect eggs. I wouldn’t have to sit up at night hoping to catch whatever has been eating my birds. If the birds were indoors I could control light and temperature for optimum egg production. As it stands, my birds go to bed early and get up late because the sun goes down early and gets up late. So egg production has fallen off. 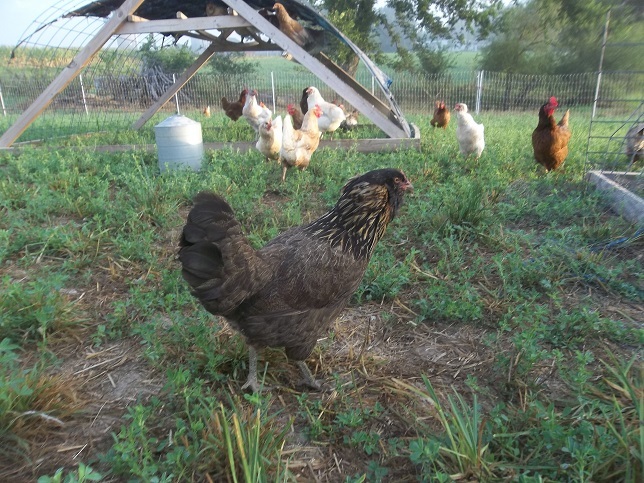 You want to know why our eggs are more expensive than the “cage-free organic” brown eggs at the store? Because it’s a lot of work to maintain a flock of safe chickens living outdoors with access to a wide variety of feed. But there is more to price than just cost. Customers don’t care what my costs are. Customers don’t care what it cost to raise the chick to point of lay. They don’t care how much I spend per egg box. They don’t care about the hours Julie and the kids and dad and I spend slaving away to make our chickens happy. They care that my eggs are fresh and tasty and that my birds are whole. They want to see pictures of fully-beaked birds running and flapping in the sunshine on green pastures. They know that costs a little more than eggs at the store and they are, apparently, glad to be a part of that story. In fact, I think that’s what initially attracts customers to us. They want to be a part of something. They want to know they are supporting respect. When a customer buys that first dozen eggs they usually ask me a million questions. They want to see pictures of the chickens on my phone and they want to know the story of the farm. There is no story at the grocery store. Well, there is a story at the grocery store but it’s not pretty so nobody talks about it. But after they try that first dozen they come back again and again. At some point a customer has company for a weekend and runs out of eggs. 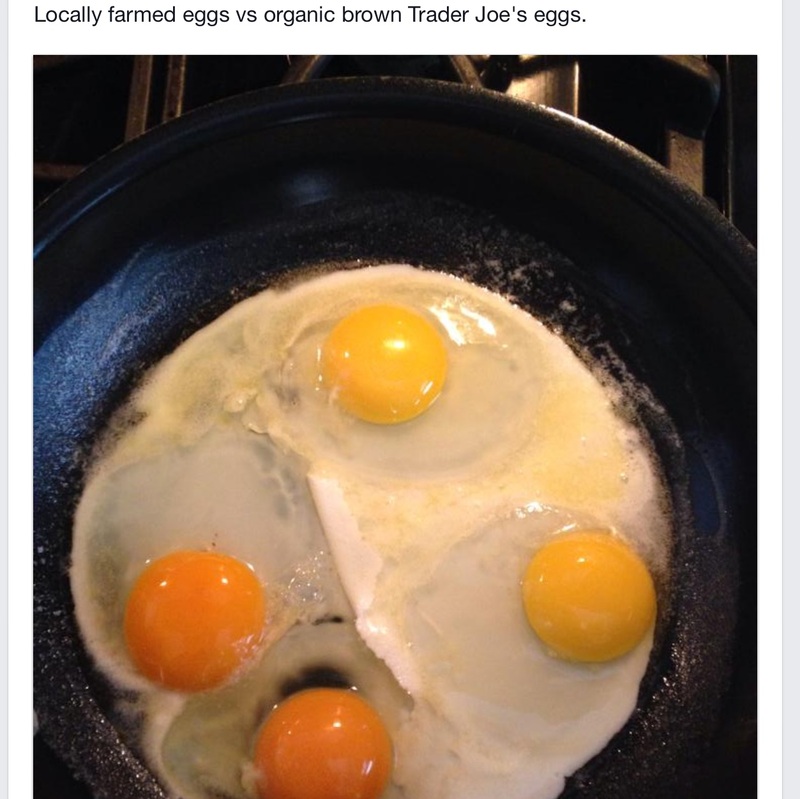 So they go to the store and buy the most expensive, cage-free organic eggs and put them in the skillet next to mine. Then they make a strange noise…the sound of disappointment. This is usually followed by getting their phone out to take a picture of the eggs, side by side, in the skillet. They then text that picture to me saying, “I can’t believe the difference between your eggs and those from the store!” or they post the picture on instagram or Facebook. That difference you see? That orange yolk that makes your blueberry pancakes turn out green? That rich flavor that you comment on? Do you know what your are tasting? You are tasting what should be. You are tasting respect. So to this point I have successfully avoided your question. You asked me why. I told you what. First because Julie and I couldn’t buy the product we were looking for. We were going bananas doing handstand push-ups and pull-ups and climbing ropes and jumping on boxes but we couldn’t find the quality of food we wanted to fuel our health. 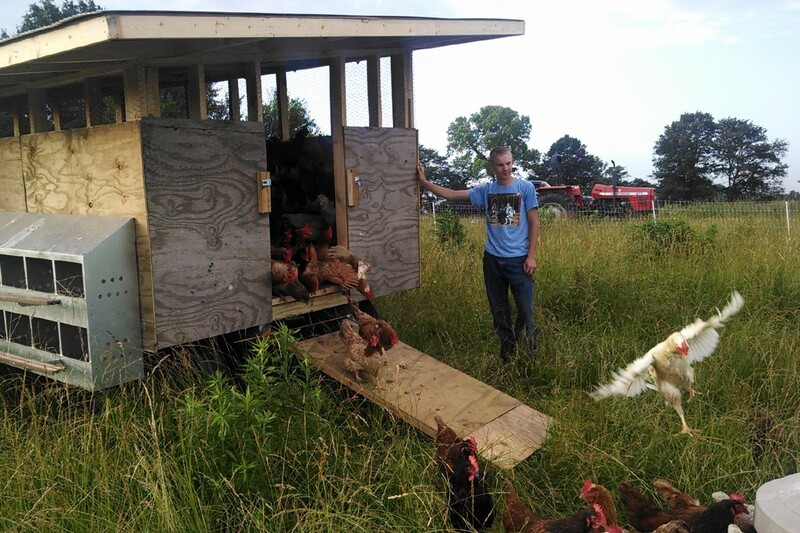 So we got a handful of old hens and built a chicken tractor in our back yard. I think only one of those old hens was still laying but that sparked a fire. It was no longer enough to have a big garden. We needed eggs! But it only takes a few birds to get all the eggs you can eat. Turns out, other people were looking for the same kind of food we were producing. In fact, we vastly underestimated demand. And price. So, economies of scale apply. We increased our production numbers without sacrificing quality. Really, with more birds to absorb our labor and infrastructure costs our quality went up…quality continues to go up each year. In fact, since eggs are only a small portion of our our overall farm revenue we can focus on quality rather than work to maximize egg production per acre. The cows, broilers and pigs help carry the financial load so the birds don’t have to shoulder the burden alone…all while making things better for all parties involved. Julie and I wanted food of the highest quality to feed our family and yours. We wanted to see animals respected and honored for what they are. Terms like “Organic” and “Cage-Free” just didn’t seem to get the job done. We wanted more. So we just up and made it happen. That’s why our beef cows don’t get corn. That’s why we try REALLY hard to keep pig noses in fresh greens…not just bare dirt. That’s why our eggs cost a little more than those in the store. But that’s also why you are a part of our story. Let’s see if I can give a more concise answer. Why do I farm the way I do? Because I like my animals. I baked cookies today. The Cherry Tree in Carlinville is hosting a book signing for me tomorrow (Saturday, December 13). Since this is a cookbook, I baked cookies. I used your eggs. The batter was moister since the eggs are larger and more golden since the yolks are rich orange. When the first batch came out of the oven I saw they weren’t as puffy as usual. It took a little time for me to realize I needed to add extra flour to compensate for the bigger eggs. LOL they are beautiful. These women mostly sold their fresh eggs to the General Store in their local town. Now 100 yrs later people are very lucky to find a local small farmer such as you to buy eggs and grass fed products from. I wonder if in 100 yrs from now there will be a sequel to this book called “Farm Gate Money: A Tribute to Grass Fed Small Farmers” summarized as (a USA version): Pioneer Grass Fed Small Farmers of the early 2000’s are among the forgotten, unsung heroes of Farm history. Facing recession, global warming, drought, floods, blizzards, declining human health, depleted soils ridden with chemicals, the conventional food supply of meat and eggs largely consisting of livestock fed antibiotics to offset their overcrowded inhumane facilities with produce and grains genetically modified and carrying the same chemicals sprayed on crops. These strong, courageous Small Farmers plunged forward through USDA, FDA, local state rulings, and nay sayers to make better health for themselves, their families, their communities, their animals, their soil, air and water supply. Why indeed! I am sure Chism Heritage Farm will have a chapter in this book! Let me set this up for you. Find the book “Love among the Chickens” by Wodehouse. There are three characters that matter in this scene and I encourage you to read this aloud. In fact, you should try to read Wodehouse twice, once just to get a handle on the crazy turns in the road, once to enjoy the language. Ukridge is large and loud. He does all the talking. When you read his parts you should be yelling. Garnet (narrator) is along for the ride…he’s ready for a change and going along with some crazy Ukridge scheme might be just what the doctor ordered. Mrs. Ukridge is small and quiet. She would have to be. See how easy? Nobody would scoff and nay say about that would they? I’m afraid Chism Heritage Farm will go down in history as a weight loss clinic and a budgeting school…the place where Chris “Ukridge” Jordan finally learned his lesson. Stay tuned. Easy money the universal lure! Ukridge has quite a crafty way to start up in poultry! I read the first 2 chapters online and I can’t believe this would have a happy ending btwn the “keep of hen costs nothing” and Ukridge’s character defined as “Ukridge was the sort of man who asks you out to dinner, borrows the money from you to pay the bill, and winds up the evening by embroiling you in a fight with a cabman” I will keep reading for the laughs and see how it ends! Weight loss clinic and budgeting school sounds like a good title for the CHF chapter of this future book! None of the stories in Egg Money had clear sailing – I think it comes with the territory. When you work with manure some days you step in it – hang in there you have come so far. Everyone in that book grew up on a farm so what they did was second nature to them which is not the case with you. You studied books, videos, blogs etc and had mentors before you started and are learning as you go too and good for you. Aside from apprenticing somewhere, how else do you think they make brand new farmers? Hands on is king -look back at your blog posts when you first started and see how far you have come! Welcome to Wodehouse. Look out for sharp, unexpected twists and uncontrolled giggles. I don’t want to spoil it for you but things turn out well enough for Ukridge. And Garnet. Wodehouse only wrote 96 books so you’ll have a busy winter. Haha…my kind of math. I love Wodehouse. I have some of my Dad’s copies on the shelf -but I admit I’ve only read the Jeeves and Wooster ones. I need to branch out, clearly. The kids prefer Blandings over Jeeves. There is a lot of cringing when Bertie repeatedly falls on his sword to help out a friend.